In today’s world, people often talk about slowing down, escaping the rat race and getting back to nature. We’re all so caught up in work and social lives – clasping our calendars and relentlessly busy with this, that and the other. It’s no wonder we’re seeking an escape to a slower pace, a chance to leave urban life and seek a more enriching experience elsewhere. As someone who has travelled through six continents and more than 40 countries, I can report that this idealized “escape” from society is not easy to come by. Civilization has scattered across most of this fine earth (and Wi-Fi has followed close behind). True wilderness is getting more and more difficult to find every year, and disappearing at a distressing rate. 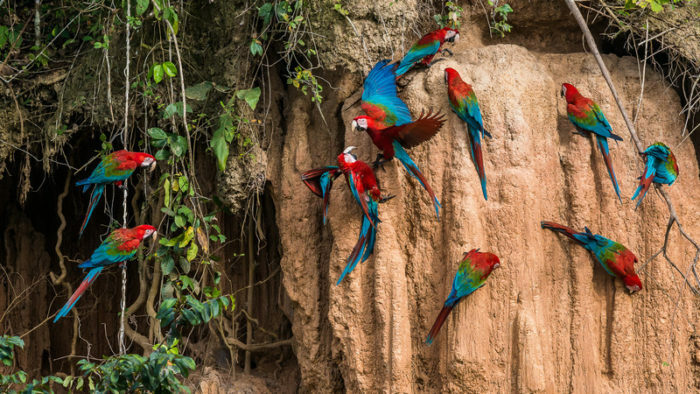 The Amazon is one of the world’s last wild spaces, making it truly stunning and unique. When I visited Ecuador it was on my must-see list, and I came away with a renewed appreciation for nature in its purest form, for its beauty and diversity, but also for its imperfections and unpredictability. Now, it wasn’t all sunshine and rainbows and deep reflective thinking. 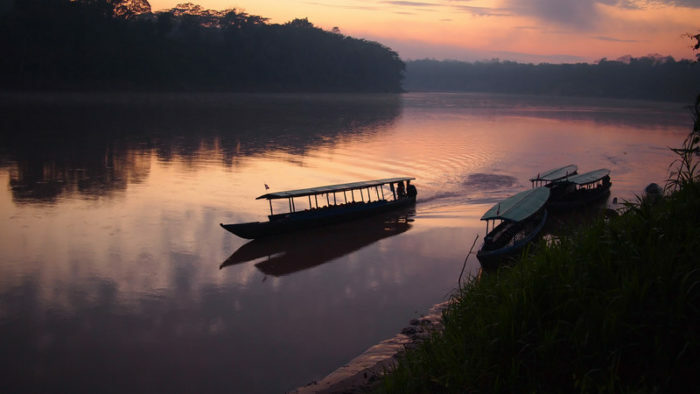 The Amazon takes a bit of a journey to get to – which comes hand in hand with being so far removed from the civilized world of Quito, where trips to the Amazon begin. A long bus journey, possibly a flight, and a boat ride stand between you and nature’s rare wonders. But hey, that’s part of the adventure! I have a motto that the hardest places to reach are the best places to be. So get your head into your book or gaze wistfully out the window as you cruise for hours from the capital city towards the wilderness. Once you’re off four wheels, it’s time to hop onto the boat (and time to put on some mosquito spray). 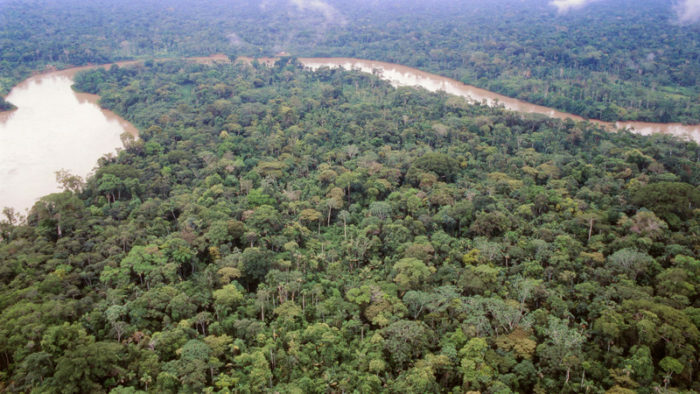 The fact that roads haven’t cut through the Amazon adds to its appeal. Cruising on a dug-out canoe through the overhanging trees made me feel like I was getting closer to nature, adapting to it instead of trampling over it. There were no road signs when we came to a junction in the watery avenues, but our guide knew exactly where to go, and that too made me feel like I was somewhere mysterious and unknown, beyond my knowledge or control. 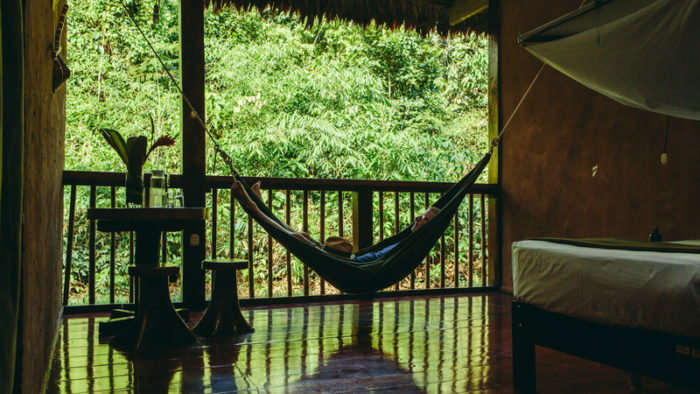 Before we’d even reached our lodge, we spotted heaps of colorful birds swooping across our heads or chilling in the treetops. We even stopped to see an anaconda curled up having an afternoon snooze (don’t worry, you don’t get too close!). It was truly incredible how our guide could spot birds in trees where I could see only leaves, or know exactly where to look on the riverbank to find snakes and caiman. Even with binoculars in my hands and the boat stationary, I sometimes found it tricky to see things that he would notice as we were moving. He was a fountain of knowledge, and at the end of each day, when we returned to the comfort of our lodge, he would take out a book full of pictures and information about birds, creepy crawlies and mammals that we’d seen, making it a truly educational experience. Our guide also made sure we were as entertained as we were informed. On the second morning he pulled our canoe up close to a wasp nest, telling us that these were called “marching wasps”. “Why?”, we asked. “I’ll show you”, he said. So he got us all to shout “DANGER!” at the top of our voices. The wasps – who I feared would soar out of their nests and attack us – began to fly against the wall of their nest from the inside at a pulsing rhythm that sounded just like an army marching. This was how they protected themselves, scaring off predators with the noise. “There you go, that’s why!” he said with a smile, knowing we’d all been expecting an attack! During our trip we were taken on a jungle walk, both during the day and at night, so as to see all of the creatures that weren’t visible from the water. This was the most informative and impressive part of the trip, and blew my expectations out the window. I learnt about trees that were used as telephones by humans, their hollow roots hit with large sticks in a system like Morse code to communicate across long distances. I learnt about ants that tasted like lemon (and tasted them! ), some other ants who could be used as mosquito repellant if you rubbed them onto your skin, about the mythical stories of the puma and how rare it was to see one, about how important each creepy crawly was to the ecosystem, every being depending on another to keep the jungle ticking over and maintaining balance. I have to admit that I approached my Amazon experience with a bad attitude – I had a mental checklist of animals I wanted to see, and I almost treated it like a zoo: “I’d like to see the pink dolphins before breakfast, and then after lunch can we head to the sloth section because I’d really like to tick that off before we leave?”. Though I did in fact see everything that I wanted to, nature doesn’t cater to our expectations or needs the way we’ve become accustomed to it doing. The Amazon is not a zoo. Every animal I saw, I was lucky to see, and I was seeing in its natural habitat. As I began to appreciate this, I felt truly humbled. Pink dolphins were what our group got the most excited for, but they are shy creatures and can only be seen at dawn or dusk. We had to adapt to their world and their behaviors in order to even get a chance to see them. Just when we’d nearly given up hope on our last evening, we managed to spot three! With a backdrop of one of the most stunning sunsets I’ve ever seen, it was a moment that I’ll never forget. Society projects the narrative that humans are number one, the top of the food chain. The Amazon reminded me that we depend on nature, and taught me that we need to respect and adapt to its needs instead of the other way round. I learnt to disconnect from my phone and to reconnect with nature, its beauty and unpredictability. I was reminded of the world’s fascinating detail, of the interconnectedness of living things, and how I could do with slowing down and learning to appreciate what I can’t control. Now more than ever we should be appreciating the earth we live on. Experts estimate that we are losing 137 plant, animal and insect species every single day due to rainforest deforestation. 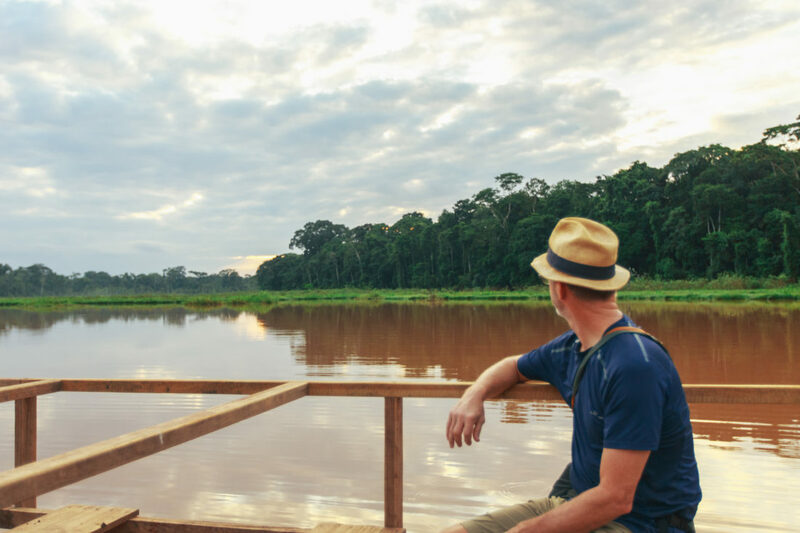 When you visit, it is difficult not to be swept away with awe not just at the Amazon, but at nature itself, and just how special our planet is. Go and see it, reconnect with the natural world we should be fiercely protecting, before it’s too late. Ready to experience a destination that’ll take your breath away? Check out Peregrine’s trip in Ecuador.